As Halloween time approaches, the stores are now filled with wonderful trinkets and decorations to augment and display our needlepoint. Consider the Halloween trees. 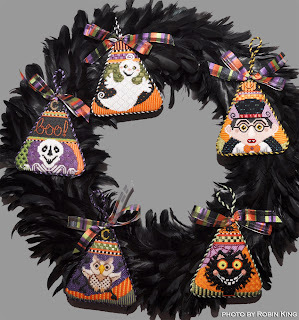 Great for hanging all of your wonderful ornaments. Check with your Florist Shops (those who decorate all-out for the seasons) as well as online (Palma alerted me to this one from Pier 1 Imports) and your local craft stores, discount and Hallmark stores. I now have 7 Halloween Trees and am always looking for more. I made my first Halloween Tree. Took a great-looking branch when doing tree trimming, and put it into a Halloween painted bucket which had been filled with sand and gravel. My ornaments looked right at home. The Feather wreaths are available, too. I googled black feather wreath and came up with many options from Party City, Michael's, Hobby Lobby, Target, Etsy.com, etc. 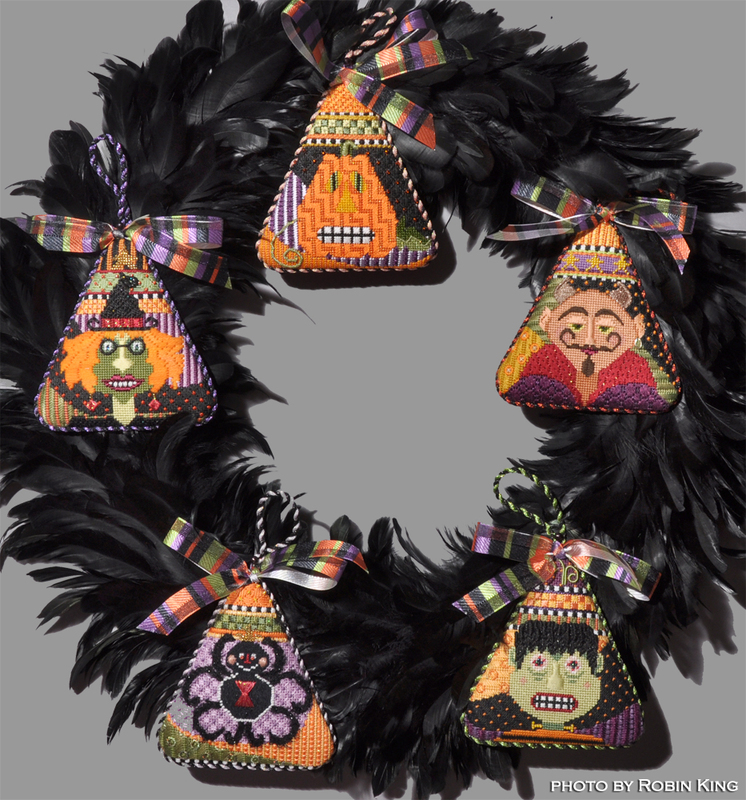 Here's 2 photos of the Creepy Characters on my black feather wreath. Speaking of Feather Wreaths, be sure to read Michele's blog, Needlepoint Tips and Techniques. She weighed the options of DIY versus Purchase Ready Made for her new Feather Wreath. Smart lady. Need special trinkets? 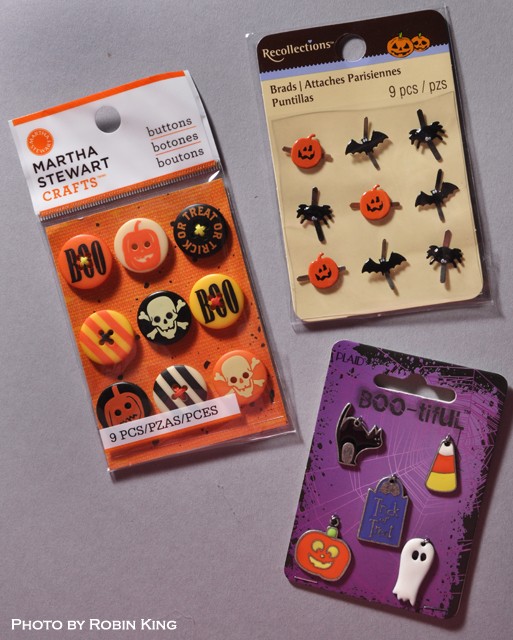 Look at your local craft store or scrapbooking store. Here is what I found at a recent trip to Michael's. Yes, now is the time to add to your stash. Don't forget the Fabric shops. 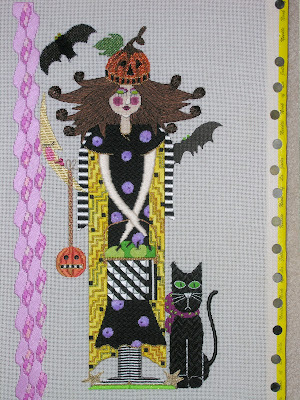 The Halloween Fabrics are great for table skirts or mantle scarves. I am honing my enabling skills... learned from the best... Jane/Chilly Hollow. Go see what you can find. 'Tis the howling season. (Thanks, Michele for the great word!) And, if you come across something fabulous, be sure to let me know. 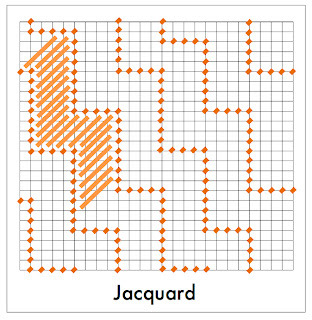 Today we are going to do a Show & Tell about the Jacquard Stitch. One of my favorites. So much so, I used it on The Pumpkin. His face was prime real estate, and I wanted visual impact... drama, if you will. 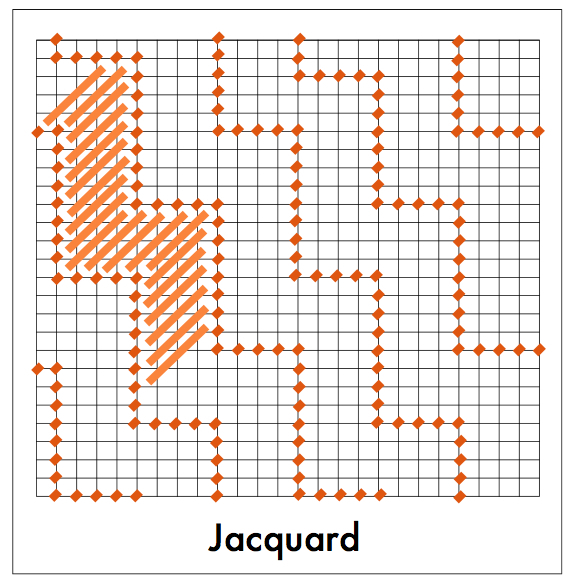 Originally, I was considering the Irregular Jacquard Stitch. 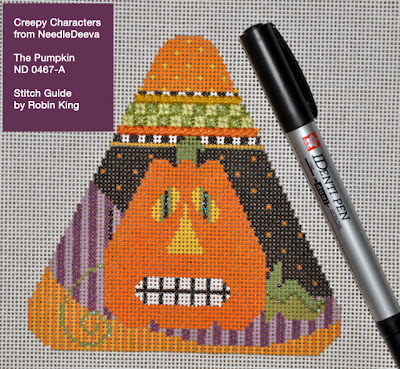 Nothing screams Halloween like the Irregular Jacquard Stitch. Irregular meaning the stair steps are skinny, fat, long and short... all at the same time. (Pssst... Irregular is code talk for Random.) You can see it on the outfit for the Witch. She is my perennial stitching partner. However, since I wanted the WOW factor, I decided to go with the "regular" Jacquard Stitch. First thing I did was plan my pathways on the computer. Seeing it in front of me started to make sense. Sure do love Photoshop! Then I stitched the Tent Stitches with the ThreadworX overdyed Kreinik. Good stuff. Then I filled in the Diagonal Satin Stitches. Kind of gave him an intense, vibrating look. Just the right amount of drama from the first Creepy Character from NeedleDeeva. Happy September Equinox. For those of us living in the northern hemisphere, today is the Autumnal/Fall Equinox. Conversely, any blog readers in the southern hemisphere are enjoying their Vernal/Spring Equinox. I found a nice website explaining the September Equinox. Their photo shows the Sun perpendicular to the Earth's north/south axis during this time of the year. Very interesting. 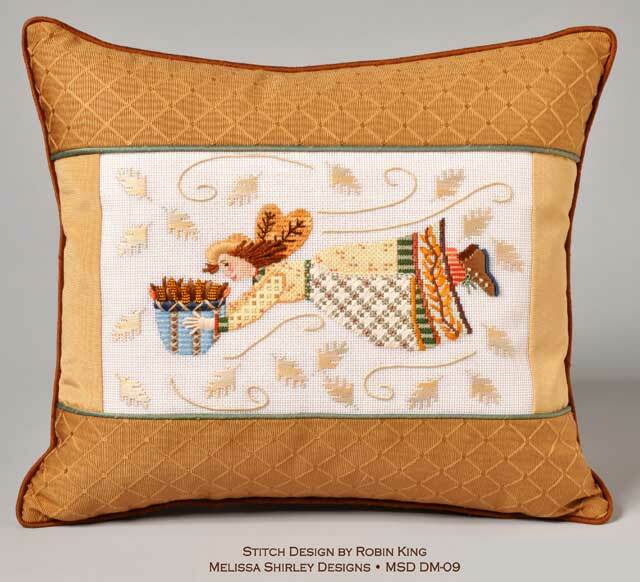 The Harvest Fairy (MSD DM-09) wanted be present for everyone's first day of Fall. I think this piece is a nice introduction to my favorite time of the year. The gripping temperatures are easing up. The leaves are starting to change colors. The wind is nice and breezy. There is a new bounce in my step. Sweet. 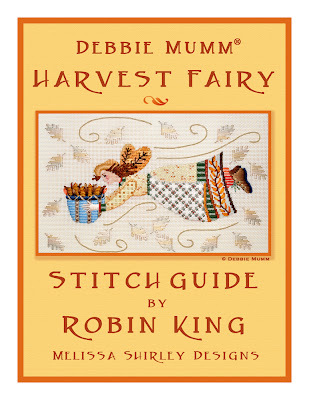 To refresh your memory, this is a Debbie Mumm® canvas from Melissa Shirley Designs. 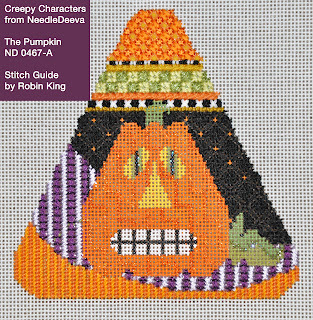 My stitch guide is available with detailed composite stitches and photographs. 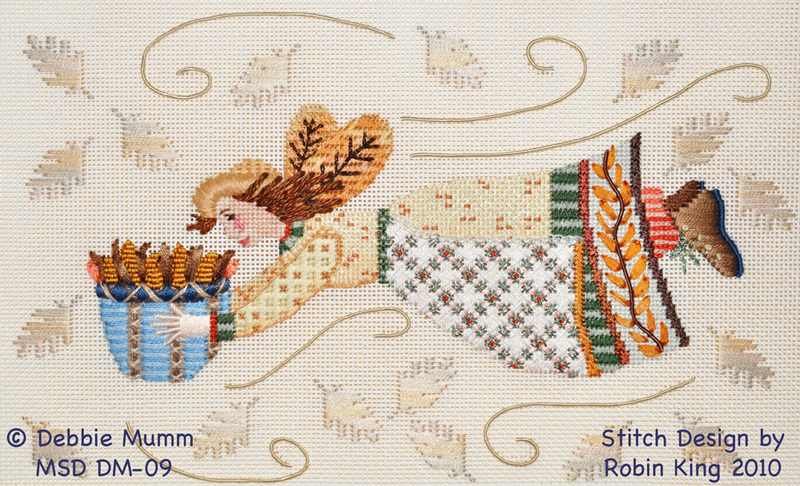 I used beads, ribbons, DMC Memory Thread, as well as wonderful threads from Gloriana, NPI, ThreadworX, and Rainbow Gallery. 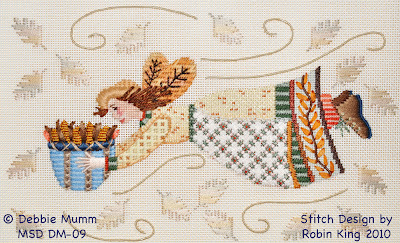 The Harvest Fairy was finished by Marlene's in San Francisco. They did an awesome job. 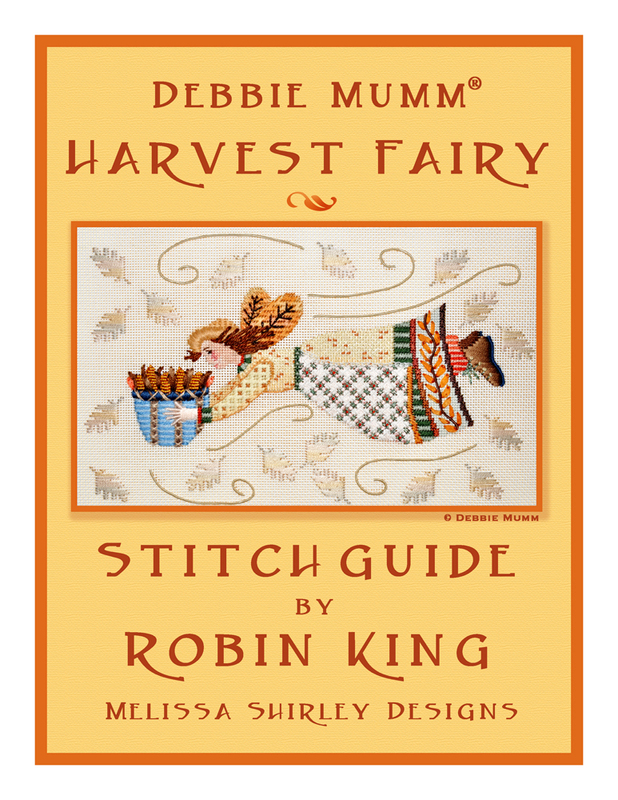 When ordering the canvas from Melissa Shirley, please request my stitch guide (SGDM09). Or, you can directly contact me for the stitch guide. Email me at creativecats@comcast.net. It works either way. The Pumpkin (ND 0467-A) has been sent out and I am going to share some behind the scene photos I took while I stitched him. When working on the background, I noticed the Orange Dots were not placed exactly where I needed for the stitch I chose. Fear Not! I got out my trusty IDenti-Pen and marked out the Orange Dots in question. Want to share a website. The author has been on fire with witty posts; often edgy. This one really caught my eye. LOVE the cats. Someone is really good with Photoshop. Subscribers to Needlepoint Now magazine should be getting their copy September/October 2011 issue pretty soon. And, when you do... check out the back cover. It's Hooty Owl from the Creepy Characters series. Then, look on page 12. There is an article about NeedleDeeva and me, as well as the complete stitch guide for Hooty. 4 pages! How exciting. 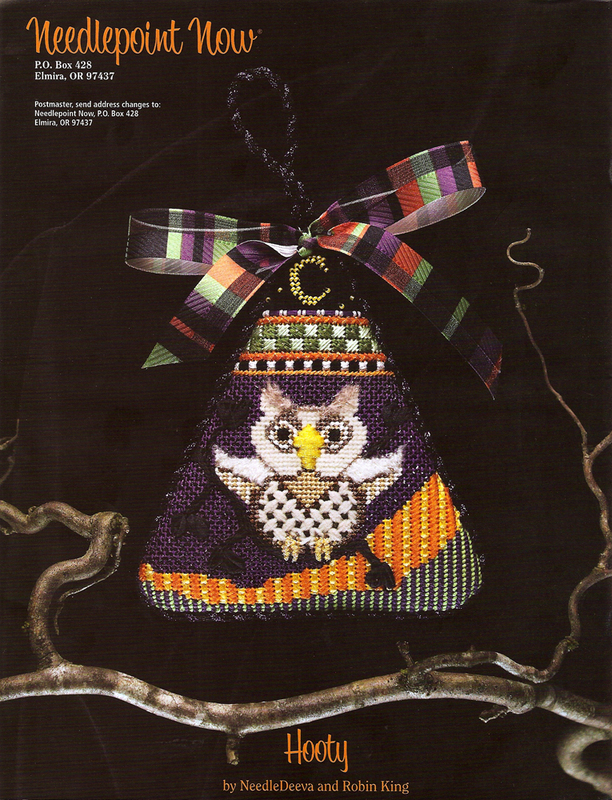 Judee/NeedleDeeva initially designed Hooty Owl (ND 0467-i) for the magazine subscribers, and for all Owl lovers, too. I really enjoyed stitching him. Some of the interesting threads I used were Fuzzy Stuff and Petite Very Velvet for a fluffy-soft Owl look. 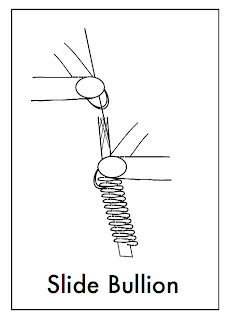 There are beading, ribbons and Slide Bullion techniques. 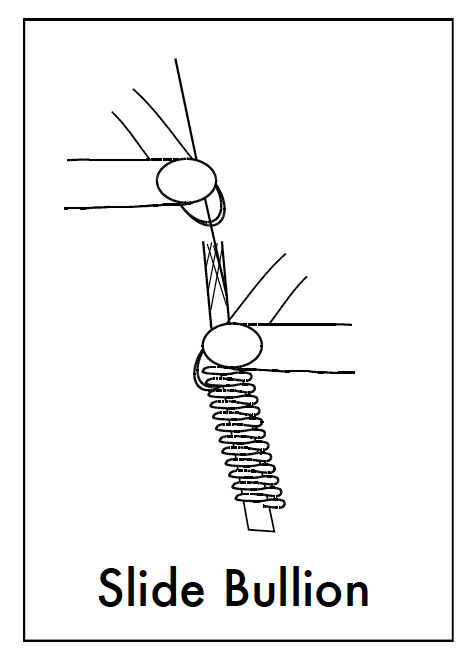 Needlepoint Now will be posting their technique video of the Slide Bullion, but here's the diagram from my stitch guide. I used Kreinik braid and frayed the end in order to grab one of the threads. Then I took the remaining braid bundle and slid down the pole... creating the Slide Bullion for Hooty's Feet. This is a fun technique and I used it on other Creepy Characters, too. Have you used it yet? I would love to hear from you. Contact your Local Needlepoint Shop to order Hooty Owl or any of the Creepy Characters. Each can be purchased individually or the complete series. 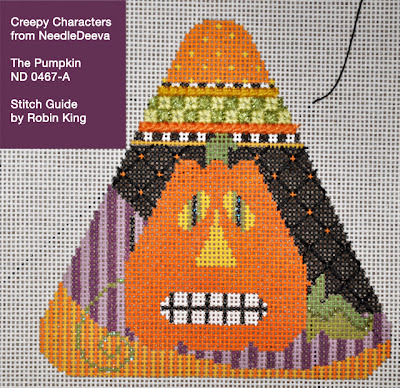 (On page 16 of the magazine, you can see the Participating Retailers, as well as on the Creepy Characters page of the NeedleDeeva website, too.) 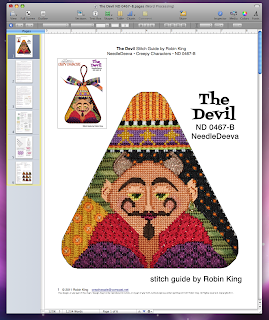 Well, back to printing out the 175 Devil (ND 0467-B) Stitch Guides. He's next to be sent out. Well, I heard back from TNNA. They said, "Thanks, but No Thanks" for me teaching in Phoenix 2012. Perhaps, I should have submitted 2 or more canvas candidates for their choices. Anyway... currently, I have enough on my plate, and will try again for teaching in Columbus 2012. I am still going to proceed with the intended class canvas. I had discussed it with a few Shop Owners while in Baltimore; they liked the concept as a class for their customers. One thing about teaching at TNNA, it does open doors for other teaching opportunities at shops across the country. So... what am I stitching? 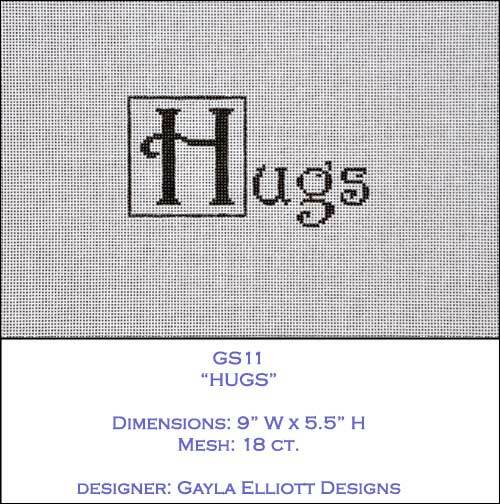 It is a NEW canvas from artist, Gayla Elliott, and distributed by Alice Peterson Company. Gayla has a nice group of Sayings canvases. 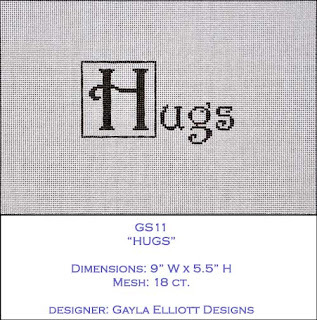 You can see them on her website: Gayla Elliott Designs. I asked Gayla for a new saying; one which I would write the stitch guide. She agreed. My mind was spinning all over the place. What message did I want to send? I never chew my onions twice. You can lead a whore to Vassar but you can't make her think. My Dad was a clever man. Witty and funny. Each of those sayings molded me into who I am today; however, they are might be too long for this needlepoint assignment. So... what is my saying? HUGS. It is my Term of Endearment. I keep "Love" for Pat. I get confused about the XOXO or is it OXOX (?)... so I usually leave that one alone. But, HUGS... feels good and lets people know I am embracing them with all of my good energy and care. I will keep you posted on my HUGS progress. 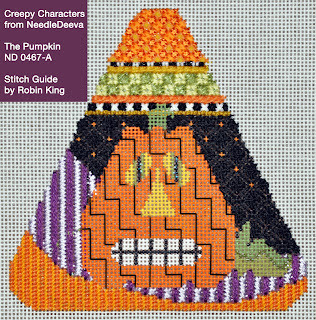 I've been auditioning stitches and have settled on a concept for the stitch guide. There are lots of options when working with a blank/unpainted canvas... which is the beauty of this next project. 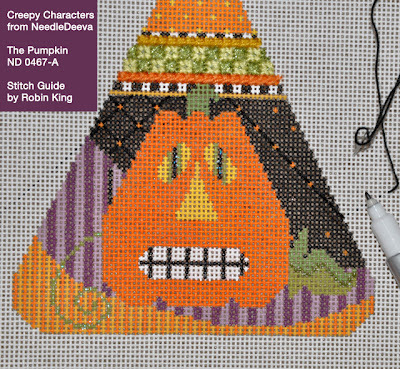 It is an affordable canvas with an open color palette... just right for creative stitches, too. And, the message is straight from my heart. Thanks to Gayla/Gayla Elliott Designs and Cathy Rapoza/Alice Peterson Company for giving me this creative opportunity.